We use modern, high-speed copiers that can get your job, big or small, done quicker than you think! Need several hundred sets of a document that has lots of pages? Need it the same day? 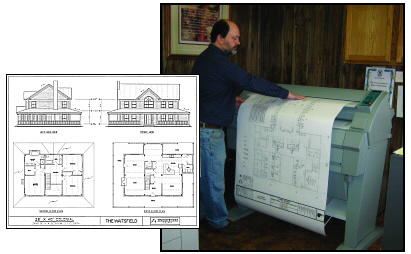 Call us and we will complete your project quickly and correctly, just for you! Need extra sets for bidding, we can copy it. Want an indestructible set for on-site? Have you been given plans to a CD that you can't possibly print them large enough to read? We can print them out to size, up to 3'x4'! Don't have time to drop off the files? Just click on the Send a File button, follow the instructions and upload your files. Let us know how many sets you want and we'll print them out for you! 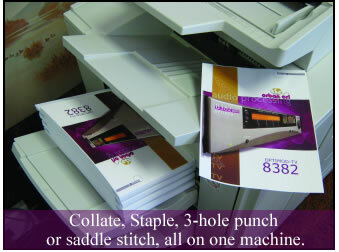 Spiral, Comb, Saddle Stitch, Perfect binding, Three Hole Punch.